***Update: Here is my shocking pink tulle skirt! Lets see... it all started with this! I saw this photoshoot of singer, songwriter Kelis (you know, her milkshake brought all the boys to the yard) on The Coveteur. Seriously, how fabulous is this fuchsia tulle ball-length skirt? She's stunning in this! You guys know I love "dressy". But, I've never done "whimiscal"! Where would Erica B. wear a tulle skirt? How would I fit this look into my wardrobe? So I obviously took to Pinterest to research! And let's not forget Carrie Bradshaw! And the lovely people at Simplicity have provided the perfect pattern: Simplicity 1427! Maybe this spring, I'll get some frou frou in my life! I think a shorter length would make a great day-to-night look! Love it...the bigger the better!! That are fabulous when they are over the top! I love the idea of it with a button down as well. It seems like that would keep the look grounded. I love the idea of it. I've always wanted to do a Carrie style skirt. Today's post inspired me to make the leap from merely lurking to an actual comment. Unbeknownst to you, you have become my style muse. 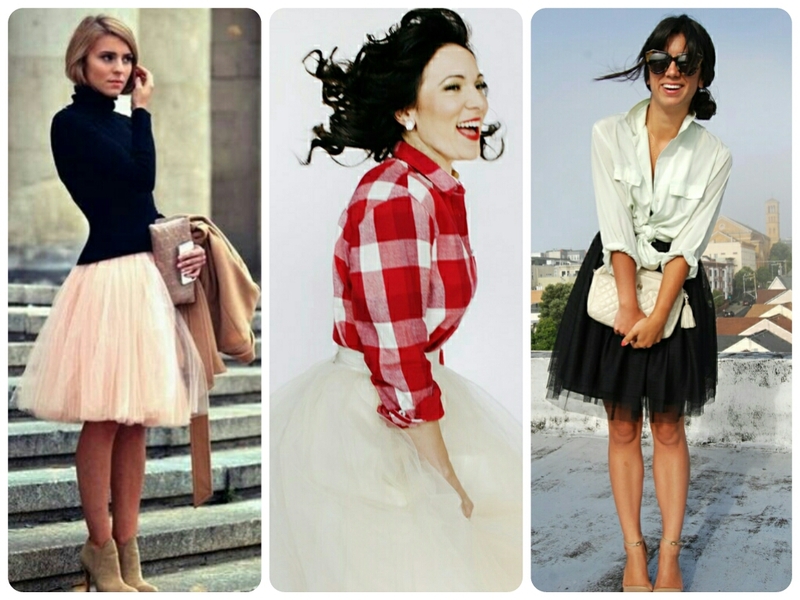 Please find a way to rock that tulle skirt! Thanks so much for coming out of lurkdom! And after having a good night's sleep, I've decided that a knee length version is a definite must have! Thanks squarefeet! Can not wait to see how you rock this look! I think it'll be a fun piece to have! Love tulle skirts. I have made 20 or more of them for my daughter and her friends. My tip learned from all this sewing is to make lots and lots of circular gores and gather them onto a band. Even though this way wastes 3 or 4 yards per shirt, Tulle is cheap and the results are worth it. Not my idea originally - I found a 40 year pattern for ballet skirts that was done this way. (McCall's, I think.) I'll have to check and see if that Simplicity pattern does it the same way. Thanks Beryl for the tip! I have the fabric and the makings but have not made yet. I ab so lute ly luuuuuv the tulle skirt!! It's fun. I like it as a ball gown, but, where would you wear it? I can see you in the shorter version anywhere. The ball gown version -- no. But the shorter version would be cool! Thanks Nancy! My friend gave me a full lenght tulle skirt years ago that she bought but coudn't fit. She said she wanted to wear it with a tee and pumps and rock out! Seeling Kelis' photo, Riki was indeed a visionary! I still have the skirt and thanks to you, I'm on the hunt for the perfect tee! WOW! I didn't know this was a 'thing'. Casual tulle???? WOW! This is why I love reading blogs! scooterphoenix, it's so popular. If you just search Pinterest, you'll see so many variations. That is encouraging. I entered a challenge on Patterns review just recently and the theme was 'inspired by the movies' and I came so close to making one of them tulle skirts with Carrie Bradshaw as my inspiration but ended up with a different outfit altogether. I still have the tulle I bought for it, so I guess I won't be out of fashion if I go ahead and just make me one (that was what stopped me lol). I think they are fabulous!! I feel like we should all have a sew-along! What about a pencil skirt with tulle type glory starting just above the knee and ending below the knee? Given your shape it would balance with the shoulders, highlight shapely ankles and no doubt killer shoes...?..? That's a thought! Thanks Body Design! I feel like this is SO your style! I think you'd be surprised how versatile you'd find it. I have a Target Isaac Mizrahi tulle skirt from years ago and it always gets compliments, and never gets me weird looks. I've been playing around with so many ideas! Thanks Laura! The colour is fabulous! I can't wait to see what you come up with. Your style is always classy and I know you will make the tulle just as classy! Can't wait to see what you make! I know it's gonna be elegant and classy! I love tulle skirts! Your blog Erica b. Is one of a select few that has inspired me to start. Sewing my own clothes I am thinking of making this skirt my first project. I have a large rear end that hikes up all of my dresses and skirts up in the back badly. Would making the back of the skirt longer than the front help keep the skirt the same length over all while allowing for the "hikage"? I fell in love with this skirt could you tell me what kind of tulle you used? Type? Just regular tulle fabric. Thanks for posting!